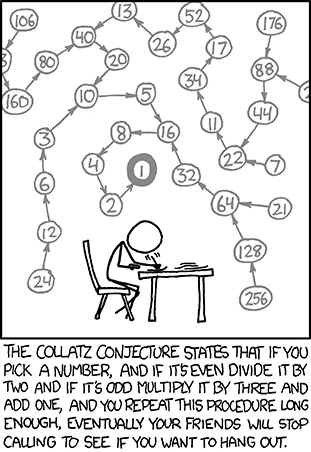 We've done a variation on this puzzle before, but then of course there wasn't a cool XKCD comic. For odd numbers we do the following: 3n + 1, where n is the current integer in the sequence. Is the three arbitrary, or does the conjecture not work for other odd values? I.e. if we take the formula as k.n + 1 does every positive integer still eventually reduce to 1? Three and five are just two values of course. How far can you check? What bounds are you putting on the calculations? And, how many of your friends have called whilst you've been doing it?